There are 2 replies in this Thread. The last Post ( Apr 7th 2018 ) by Rice. 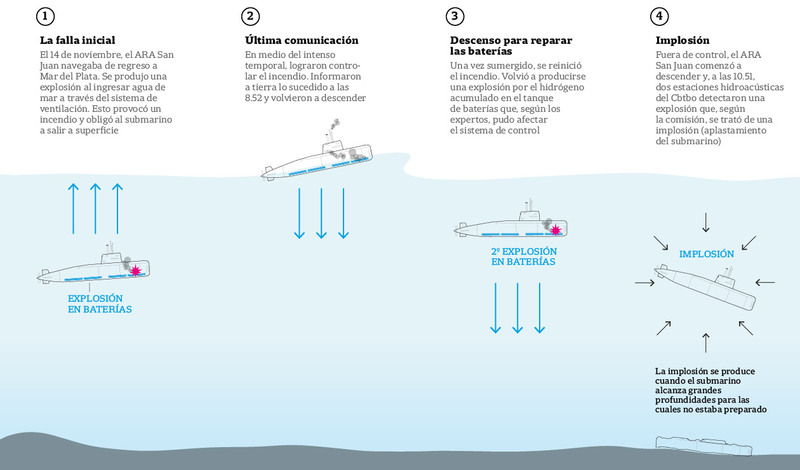 Today, La Nación published an articleclaiming that the ARA San Juan submarine experienced water infiltration though its vents, resurfaced, sunk and had a battery explosion which resulted in several hours of agony for the submarine's crew, followed by an implosion (!). Just when silence would have been an appropriate ending to this tragedy, another detail fuels the pain of the family of the 44 crew members. It is beyond my imagination the pain the crew's families have been through during these months, and this little information scattered here and there doesn't definitely help. They just make worse a situation which is well beyond irreparable. During our summer in Mar del Plata, I was moved by the many flags and shows of support outside the naval base. The silence from authorities was astounding. Tragedy do happen, but convent silence is a different story altogether. "Just when silence would have been an appropriate ending to this tragedy, another detail fuels the pain of the family of the 44 crew members." I'd like to think there was a time when responsible journalism would have prevented printing this kind of speculation for just the reasons you stated. If there ever was such a time, it's been gone for at least as long as polite political discourse. Completely agree. The truth doesn't always set you free.